It’ll start rolling out in mid-September. Google is ready to unveil a shiny new version of Wear OS at last. This is the third major release of the platform (the first since rebranding to Wear OS), and Google finally shows an understanding that what people want from a smartwatch is not a phone replacement. They want a reliable daily assistant and coach that is fast and unobtrusive. The new system doesn't have obvious battery life enhancements, though, which is still a major pain that the industry has yet to solve. It may be up to Google's partners to figure that out for themselves. 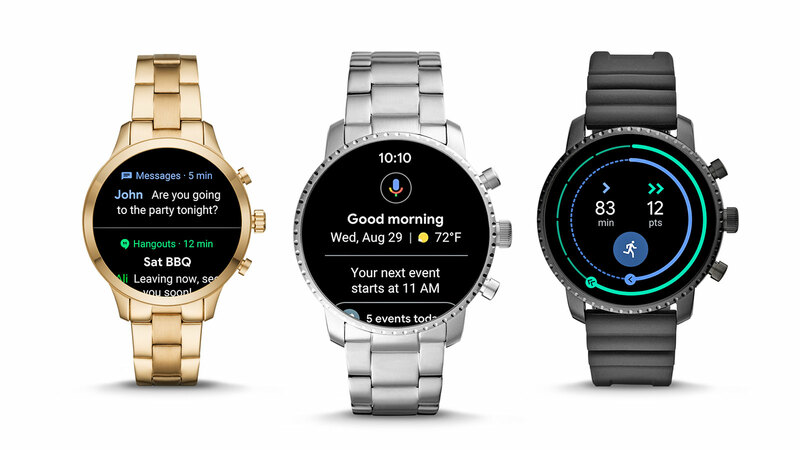 Dennis Troper, director of product for Wear OS, told Engadget that his team focused on three key areas when redesigning the platform: helping people remain connected, providing proactive help from Google Assistant and enabling people to lead healthier lives. It may sound a little counterintuitive, but Troper believes that helping people remain connected will free them up to be more present in the real world -- a goal that ties in neatly with Google's recently launched Digital Wellbeing initiative. It's the company's way of trying to make people aware of how much time they spend on their phones, allowing them to set time limits for specific apps and disconnect. Android P devices can even go grayscale as a cue that users should be winding down and maybe getting ready for bed. The new Wear OS is designed to help someone stay on top of important events and people in their lives without having to stay chained to their phones. Based on his team's observations, Troper noted that people tended to carry out fleeting interactions on smartwatches -- mostly glances, quick replies, dismissing notifications, etc. ... The goal when people turn to their watches is to deal with minor matters as quickly as possible, then return to whatever they were doing in the real world. That's why efficiency is so important in the redesigned platform. Google's research says people spend only about five seconds interacting with a watch on average, and the new software should get you what you need in that time. The changes in navigation are probably the biggest difference existing Wear users will notice. The entire interface has been rearranged. In Android Wear 2.0, swiping horizontally would change your watch face. Now you'll have to long-press on the home screen to do that instead -- a return to the original gesture for this on the first generation of the OS. Swiping to the left now brings you straight to the circles that represent your Move minutes and Heart points, which you might be familiar with if you've been using the recently redesigned Google Fit. To see more detailed stats, you can tap here to launch Fit the app. Positioning the user's health stats right next to the watch face (if not on top of it, with the right dials) gives those fitness metrics a sense of importance that adds to the third "key area" Troper mentioned (but more on that later). Swipe to the right and you'll find the Google Assistant waiting for your orders. Swipe up and you'll see your notifications. The notification cards are smaller now, so instead of them taking up the entire watch face, you'll see the beginnings and ends of previous and subsequent alerts too. It's a small tweak, but it goes a long way in making the UI feel streamlined. You can breeze right through 30 notifications instead of having to scroll through them one by one. Google also reduced the number of steps it takes to react to these alerts. Tapping on each of them will expand the alert, letting you do things like fire off a quick reply from within the notification stream, instead of having to go to another page like before. Finally, swipe down and you'll find your settings panel like before, with one small but useful difference. On devices with NFC, one of the icons here will be a Google Pay button, so you can press it and activate your primary payment method on the watch. If NFC isn't available, you can customize that spot to be something else, like Find My Phone, which Stefan Frank, product manager for the Wear OS software experience, said was surprisingly popular. All that's left is the All Apps page, which you can pull up by pushing the physical knob or dial on each device. Navigating Wear OS feels markedly faster than before, at least from my brief observation of the demo version on Frank's wrist. Getting the system to be super-breezy seemed like a personal mission for him, who said his team was "on the warpath against spinners" -- the rotating circles that used to show up on the screen when something was loading. It isn't just the navigation update that makes things feel breezier -- Assistant was a lot faster during my preview of the new Wear OS too. In my experience, Assistant on Android Wear 2.0 has been excruciatingly slow, though I generally blame poor hardware and WiFi for that. On Frank's wrist, Assistant was ready to listen at the push of the dial, and transcribed his command "Remind me to tell my son to take in the package" in about a second. It quickly followed up asking when the reminder should be sent. But Assistant also feels more helpful, because it proactively offers information like details about your upcoming calendar events, commute and weather forecast each morning. You'll see this laid out on the page when you swipe right from the home screen. It's also supposed to offer travel and restaurant recommendations, in addition to morning and evening briefings, and Google plans to add more content over monthly releases. Troper described an example: Say your hands are full with luggage and snacks for the road. Ideally, you should be able to very quickly glance at your watch and get your flight status or boarding pass without pulling out your cell phone. Health-tracking has taken center stage in the new Wear OS. And since it's so much easier to see your stats and access Fit now, you'll have fewer excuses to neglect your fitness. Swipe once to see your progress on movement and cardio activity, then tap in to see details. On this page, you can also press a button to start a workout. By default, it will go with whatever your last activity was (running or biking, for example), if you want to change it, you can tap to find an alternative. All existing Wear users with watches on version 2.0 and higher will get the new software when it rolls out in two weeks. Since many devices running the original Android Wear were updated to 2.0, this means almost all of them will get the latest upgrade. There are a few exceptions, like the Moto 360, but "basically everything will get the update." Like all major changes, the new Wear OS might take a while to get used to and you might not even even be impressed by it at first. But give it time: Frank said testers have reported significant increased satisfaction over two weeks. In fact, the company's own director of engineering apparently didn't initially like the new notification stream but came back two weeks later and said to Frank's team, "This is really good." I'm already stoked about how much faster scrolling through notifications is, and I'm sure I'll appreciate it even more with real-world use. One thing I wish I heard more about was battery life. But Google did tease a partnership with Qualcomm at I/O. And the chip maker has a smartwatch-focused event planned for September 10th, right around the time Google plans to start rolling out Wear OS. So maybe we'll get more info then.